Clearcuts often create stark boundaries between forest habitats. These ecological “edges” can seriously affect neighboring undisturbed ecosystems for some distance in from the edge, perhaps representing a multi-decadal legacy of has clearcutting. A new study led by David Bell took on the question of how historical timber harvests have affected the structure of neighboring old-growth forests in western Oregon. 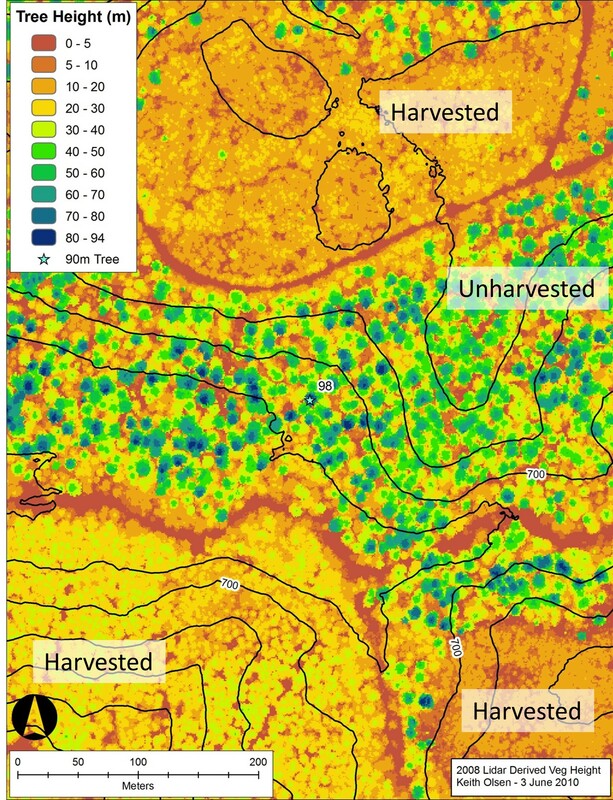 Bell and his team used a remote-sensing technique called lidar to map tree basal area (a measurement related to tree density and biomass) in lower and middle elevation mature and old-growth forests in the Andrews Forest. They then assessed how harvest edges have influenced tree basal area and how those effects varied with harvest size and age. They found that forests within 75 meters of harvest edges (approximately 20% on the unharvested forests) had 4-6 percent less live tree basal area than forests tucked in the interior away from edges. They were surprised to find that the length of time since harvest had little or no effect: whether the harvest happened 13 years ago or 60 made little difference on the structure of surrounding unharvested forest area. This implies that the edge influence persisted over many decades in spite of forest recovery processes. This study is important in examining the subtle impact of human activity on forest landscapes in western Oregon and showing how widespread and long-lasting the edge influence of past clearcutting has been on neighboring old-growth forest.